Learn barefoot massage in an intuitive way. in way that makes sense. You'll discover how to use your feet like you do your hands. All barefoot masage ce trainings are held in Cincinnati, OH unless otherwise noted. Winter 2019 -get warm in Florida! Expand your knowledge with 2 more styles of barefoot massage training! Our strokes designed are based on years of barefoot massage experience with the Authors’ personal clientele base and of other therapists. You'll learn how to use your feet to provide a full body deep tissue massage with focus on myofascial release and trigger point work. 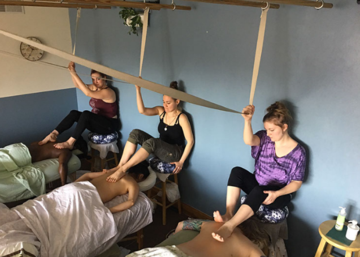 Using an overhead bar system for support, your client will lie comfortably on your massage table while finding deep, therapeutic relaxation. Special attention is used with techniques on the posterior side of the client's body. Your weight and natural gravitational forces are untilized to effortlessly maintain consistent pressure for-easily-a 90 minute (or longer!) comfortable deep tissue massage. In fact, gravity allows the therapist to almost quadruple her/his pressure over that of a pointy thumb. Comprehensive, detailed "feet-on" time allows you to work on a multiple of therapists in class as well as a minimum of 2 in our student clinic. You'll learn to "sink and sync" with your client's body. Find out here if your feet are soft enough for barefoot massage training. Could you stand to lose a few pounds? Here's my take on therapist size.